The Kirtland’s warbler. Photo by Cindy Mead. Asian carp spawning moves closer to Lake Michigan (Milwaukee Journal Sentinel): New evidence shows that spawning Asian carp have been found nearly 100 miles upstream from their previous spawning sites, putting them closer to Lake Michigan. Last month, President Obama introduced efforts to protect the Great Lakes from Asian carp, including upgrading electronic barriers. 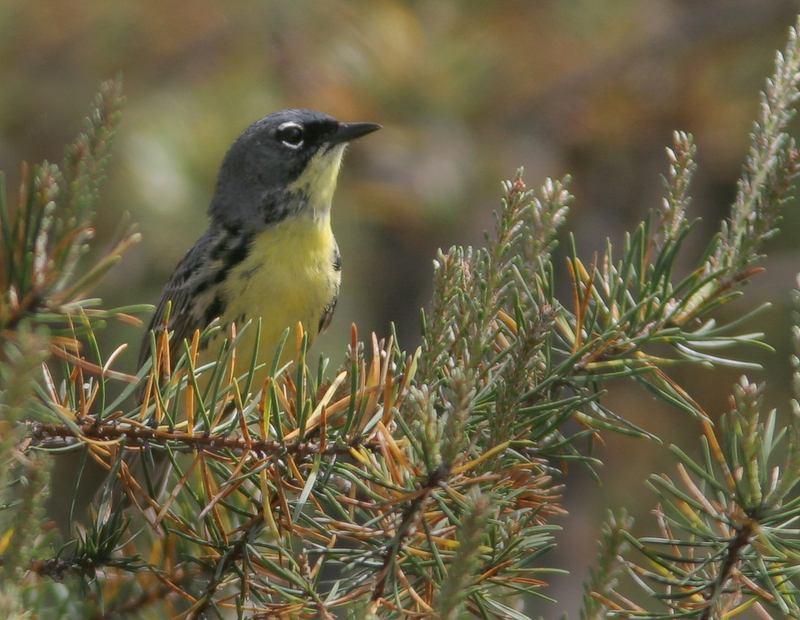 Huron Pines receives grant to help fund Kirtland warbler efforts (Alpena News): Huron Pines has received a $171,000 grant to continue its work building a support network for the Kirtland’s warbler. The organization will use the funds to continue to build relationships between federal, state, regional and private partners to support the bird when it’s removed from the Endangered Species List. Lake Erie algae bloom intensifying (ABC 13): A new report shows that the algae bloom in Lake Erie is intensifying. At Ohio’s Maumee Bay State Park, a health advisory posted at the beach indicates there are unsafe levels of bacteria in the water. This bloom is not as large as Lake Erie’s 2011 bloom, but it is larger than last year. Speed limits affect birds’ behavior (Conservation Magazine): A new study shows that European birds fly away from cars sooner on roads with higher speed limits. The study, conducted on roads in France, observed 134 flights by birds from 21 species, mainly carrion crows, house sparrows, and common blackbirds. It was noted that the actual speed of the vehicle did not affect the birds’ flights. Catch a close view of some iconic fish (Up North Live): On Friday, August 30, the Black River sturgeon hatchery will be offering public tours from 9 a.m. to noon. During the tours, researchers from the DNR and Michigan State University will discuss lake sturgeon biology, reproductive ecology, and research. The hatchery is located in Cheboygan County on the Upper Black River. Tours are free of charge. Tens of thousands of years ago, glacial debris formed rolling gravel hills and out wash plains across southern Michigan. Today, these landforms are still present, drawing tourists to see what is now known as Michigan’s Irish Hills. The area will be featured on MNA’s 2013 Fall Adventure, a weekend-long trip exploring sanctuaries in southeast Michigan. The Irish Hills include a combination of unique history, picturesque landscapes and over 50 lakes that have entertained and amused guests for centuries. Located roughly in southeastern Jackson County and northwest Lenawee County, the Irish Hills land was settled by Irish immigrants from 1830 to 1850 and eventually became a popular stopping point for travelers along Old Sauk Trail. The trail itself has a very interesting background, as paleontologists have found evidence suggesting that it was a game trail running along the southern edge of forest line. The road had once been used by Native Americans and was later converted into a stagecoach road between Detroit and Chicago. The Irish Hills became a popular stopping point for travelers along this five-day journey, making it one of the state’s first tourist attractions in the 1920s. Along the Old Sauk Trail sits Walker Tavern, a historic site that was once a small restaurant for passing travelers. The tavern is one of twelve sites in the State of Michigan Historic Museum system, and it is open for touring. Though never proven true, it is believed that early American statesman Daniel Webster once stayed in the tavern. On MNA’s Fall Adventure, participants will be able to visit Walker Tavern. In addition to its unique history, the natural geology of the Irish Hills keeps visitors coming back year after year. The Irish Hills area is the highest elevated area in southern Michigan, with its rolling hills still showing evidence of early glacial activity. The hills are vibrant green in the summer and display shades of red, orange and yellow in the fall, providing visitors with great photo opportunities during these seasons. MNA’s Columbia Nature Sanctuary offers a spectacular example of the hills’ colors, which participants will be able to visit during the Fall Adventure. The Irish Hills area also includes some interesting waterways, as many of Michigan’s rivers have their headwaters in this area and eventually flow to both Lake Michigan and Lake Huron. The beautiful fall colors at Columbia Nature Sanctuary. Photo courtesy of Jeff Ganley. In addition to its beautiful geological features, the Irish Hills area includes a variety of habitats, including prairie fen, wet prairie and oak savanna-barrens-woodlands. Because of their rarity and diminishing nature in the Midwest, the area’s prairie habitats are especially important. Many rare plant and animal species can be found in the area’s prairies, offering a significant contribution to Michigan’s special diversity. Sand Creek Prairie Plant Preserve, one of six MNA preserves featured on the Fall Adventure, is home to many scarce and threatened plant species. For decades, people have continued to visit the Irish Hills for its large lakes, beautiful scenery and unique attractions. Explore this beautiful and historic area by attending MNA’s 2013 Fall Adventure, Sep. 20-22. In addition to exploring the area’s geography and habitats, visitors will get to hear about research conducted at MNA sanctuaries and enjoy food from local eateries. To reserve your spot on the trip, contact Danielle Cooke at (517)-655-5655 or dcooke@michigannature.org. We hope you’ll join us in witnessing the scenic Irish Hills! Animal rights advocates launch new petition to drive halt to wolf hunting (Detroit Free Press): Animal rights advocates launched a petition drive on Monday to repeal the law that would give control over setting wolf hunts to the Natural Resources Commission. Passed in May, the law bypassed a petition drive mounted by activists last year that would have put a halt to a hunt of grey wolves in the Upper Peninsula. If the petition drive is successful, voters will face two ballot issues on wolves in November. Michigan’s recycling rate is lowest in Great Lakes region (WKAR):Michigan’s recycling rate is just 20 percent, 10 percent lower than the regional average. Governor Rick Snyder is hoping to change that. In 2012, he identified increasing recycling rates as a priority for his administration. How ‘insect soup’ DNA could help conservation efforts (Mother Nature Network): Researchers are turning to a method known as “metabarcoding” for identifying endangered insect species across the globe. The process involves identifying species from fragments of DNA in a single bulk sample, such as an “insect soup” or various crushed bugs. Though it may seem strange, researchers believe metabarcoding could allow could enable scientists to identify endangered insects that would otherwise go unnoticed across various regions and continents. Vigilant residents take on lake invaders with hot water (Great Lakes Echo): The Glen Lake Association is doing its part to fight against invasive species with its boat-wash program in the northwestern Lower Peninsula. The boat wash station uses a warm-water spray to clean the hull and flush the engine of boats that have been in another lake. The program began in 1994 and efforts seem to be paying off; Big and Little Glen lakes are nearly invasives-free. Climate change alters apples’ flavor (Conservation Magazine): A new study reports that Fuji apples are becoming softer and sweeter as a result of global warming. Scientists studied the apples from 1970 to 2010 and found that the annual average air temperature at the site increased by 0.31 to 0.34 degrees Celsius. Over that same time period, the apples’ acid level and firmness dropped. 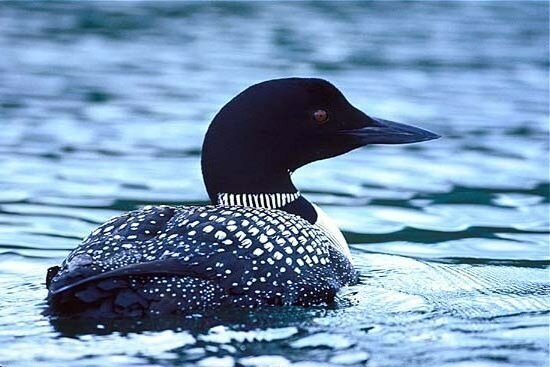 Great Lakes loons dying in record numbers from botulism outbreak spurred by ecological disturbance (AnnArbor.com): Common Loons, Great Lakes birds roughly the size of small geese, are disappearing at an alarming rate as a result of a surprising source: Botulism E., arguably the most poisonous substance known to man. According to the Great Lakes Science Center, the toxin is transferred from rotting algae to algae-eating Gobies, eventually infecting Goby-eating birds such as Loons. The consequences are significant, as scientists estimate that 3,000 Lake Michigan Loons were killed from botulism in 2012 alone. Should Canada Geese be killed off instead of mute swans? DNR, readers weigh in (mlive): Opinions are buzzing around Barry County’s approved plans to eradicate its mute swan population. According to wildlife officials, the swans are an invasive species which can harm ecosystems by depriving native wildlife of food. However, many individuals voiced concerns in response to this movement, believing that Canada Geese are actually more problematic than mute swans. Still, DNR officials point out that, while the geese are a pervasive presence across the state, mute swans are still more ecologically harmful. “I Will Act On Climate” 27-state bus tour arriving in Michigan Monday (CBS Detroit): Former Michigan Governor Jennifer Granholm will join a group of community members Monday morning to host the “I Will Act on Climate” bus tour at its Muskegon stop. The bus tour is a step toward creating a national energy policy, traveling from state to state and rallying communities to act on climate change. The movement comes as a result of President Obama’s first-ever carbon limit announcement roughly two months ago. In addition to Muskegon, the bus will stop at Peoples Community Services in Detroit Monday afternoon. Wild rice mounts a comeback for culture and ecology (Great Lakes Echo): Native Americans and ecologists across the state are working to restore native wild rice, a crop that had nearly disappeared from Michigan’s waters. Though the plant was once common in streams and rivers across the state, invasive species, raised water levels and property owners clearing waterways have limited sizable beds of the tall grass to less than one dozen. The Native Wild Rice Coalition, a group working to restore wild rice for its ecological and cultural significance, has implemented plans to educate individuals about the plant in hopes of eventually changing state regulations. Predatory ‘frankenfish’ caught in Virginia nets world record (Mother Nature Network): A Virginia fisherman has caught the world’s largest northern snakehead at 17 pounds 4 ounces, confirmed by the International Game Fish Association. The northern snakehead is an invasive, carnivorous predator with razor sharp teeth. Adding to its Frankenstein-like qualities, the creature can breathe air and survive out of water for up to four days. Northern snakeheads were first spotted in a Maryland pond after their release from a fish market, and the species has since spread into rivers across the nation. Birdwatchers often pay close attention to detail. Usually, a keen sense of hearing and a good pair of binoculars are a necessity for spotting birds in the wild. Finding the Sandhill crane, however, is a different story. Considering its size alone, the Sandhill crane is not subtle. On average, males weigh about ten pounds, with females around eight pounds. Though adult birds are gray overall, their distinguishing features are their red featherless foreheads, white cheeks and long black bills. The birds stand on long, dark legs and are about two to four feet tall. Despite their size, Sandhill cranes are very skilled soaring birds, with a flight style similar to eagles and hawks. Unlike herons, which bend their necks in flight, Sandhill cranes keep their necks straight when flying. Sandhill cranes are migratory birds, breeding in Canada and areas of the northern United States (Michigan included) in the summer and retreating to Texas, Florida and Mexico for the winter. The birds sometimes travel south in flocks of over 10,000 birds in concentrated areas, creating a spectacular sight for migratory areas in late fall. Most breeding pairs in Michigan’s Lower Peninsula are found in a six county area near Jackson and Ann Arbor, with highest Upper Peninsula concentrations in eastern counties. Some MNA sanctuaries are home Sandhill cranes, as these interesting birds nest at Lefglen Nature Sanctuary in Jackson County and have been spotted at Goose Creek Grasslands in Lenawee County. Because Sandhill cranes are ground-nesters, building their solitary nests in or near shallow water, they are often found near marshes or bogs. The bird’s eggs are pale brown and relatively large, and its chicks are dark orange and fluffy. Offspring begin breeding when they are 2-7 years old, and sometimes live for roughly 20 years. The cranes can also be found feeding in corn and upland grain fields, as their diet mainly consists of grains and seeds, with a few insects and invertebrates added to the mix. The call of the Sandhill crane allows birdwatchers to identify the species without even seeing it. Frequently, the bird gives off a loud trumpeting sound, which can be heard from a far distance. The Sandhill crane’s unique sound resembles a French-style “r,” rolled in the animal’s throat. Intensifying the noise, mated pairs often participate in an act known as “unison calling,” where the two stand close together and call in a synchronized manner. Regarding conservation, the Sandhill crane is not considered threatened as a species and is one of the few crane species that are still common. With a population of over 400,000, the Lesser Sandhill crane is the most plentiful crane alive today. Still, its three southernmost subspecies, the Florida, Mississippi and Cuban Sandhill cranes, are rare and face multiple population threats. Habitat destruction has had an especially negative effect on Florida Sandhill cranes, though it is expected that management strategies will keep the species from becoming critically threatened. In Michigan, Sandhill crane numbers were reduced by shooting and habitat destruction in the late 20th century but have grown in recent decades. An excellent opportunity to see Sandhill cranes in the wild is MNA’s 2013 Fall Adventure, September 20-22. The weekend of guided tours will explore Michigan’s Irish Hills area, which is home to many of the Lower Peninsula’s Sandhill cranes. For more information on the trip or to reserve your spot, contact Danielle Cooke at (517) 655-5655 or dcooke@michigannature.org. Masses of plastic particles found in Great Lakes (The Weather Channel): In the already polluted Great Lakes, scientists are discovering great quantities of tiny, plastic pellets, some of which are only visible through a microscope. It is suspected that the pellets are abrasive “microbeads,” commonly used in facial washes and toothpaste. Because of their miniscule size, many of the plastic specks flow through water treatment plants and into the lakes. The plastic beads soak up toxins from the water and harm the fish that mistakenly eat them, causing significant ecological damage. Research groups are urging personal care companies to stop developing microbead products, hoping to keep the plastic out of the Great Lakes altogether. Michigan’s first wolf hunt will no longer include trapping (Detroit Free Press): Michigan’s Natural Resources Commission has rejected the use of steel-jaw leg traps during the state’s first-ever wolf hunt, applying to both public and private land. According to specialists from Michigan’s Department of Natural Resources, the regulation was added to the approved hunt to help ease into the public harvest as a management tool and to start the hunt conservatively. Still, other groups believe the regulation is a tool to compromise with the hunt’s many opponents. Could these mice save threatened Midwestern prairies? (Huffington Post): Chicago’s Lincoln Park Zoo is raising mice in an effort to bring back restored prairies. Researchers are releasing the mice in hopes that the animals will mate and distribute the grassland seeds that they eat, aiding in the spread of plant life. Currently, biologists believe that only 1 percent of historical prairie grasslands remain in Illinois. The Chicago team is implanting trackers on the mice to see if spread of the species can work as a natural restoration agent for plant life in diminishing prairies. Michigan senators and congressman consider Great Lakes cuts (Petoskey News): The U.S. House Committee on Appropriations considered a bill Wednesday with the potential to cut 80 percent form Great Lakes funding. The funds have been gradually dropping form the initial amount of $475 million in 2009, and would fall from $285 million to $60 million if last week’s draft of the bill were passed. The committee chose to raise this proposed amount to $210 million for the 2014 year. Michigan senators Carl Levin and Debbie Stabenow still oppose the cuts, believing that the initiative funds critical restoration efforts such as combating the invasive Asian carp species. 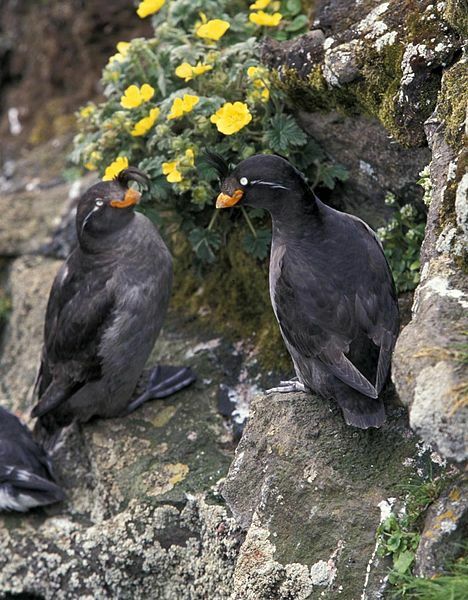 Crested auklets rely on scent during breeding season. By a nose: Birds’ surprising sense of smell (National Wildlife Foundation): While previously believed to be anosmic, or unable to smell, new discoveries show that some birds extensively rely on scent. Biologists from the Alaska Department of Fish and Game’s Wildlife Diversity Program are studying small seabirds called crested auklets, located off western Alaska in the Bering Sea. In groups or pairs, the birds bury their faces into each other’s citrus-scented feathers, occurring every summer during breeding season. Additionally, other findings suggest that songbirds are able to recognize their kin based on smell, and that European starlings rely on scent when selecting certain plants for their nests. Climate change report: As Michigan warms, new crops, plant life and disease may take hold (mlive): A report by the Union of Concerned Scientists predicts radical consequences of climate change for the state of Michigan, anticipating the state’s climate to become similar to that of northern Arkansas by the end of the century. Along with increased temperature, the report states that incidents of flooding and extreme storms will rise, lake levels will drop and wetlands will shrink. Though the predictions of this report parallel many other analyses, its findings make clear the potential ecological and economic results of climate change in Michigan.